***** There and Back Again Well-designed literary resource with some movie info and images. 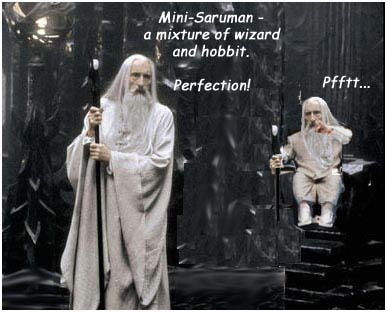 **** The Lord of the Rings Fanatics Page General site with some movie info and a 111-question Quiz. **** The Tolkien Trail Fun book site with games, original art, and more. *** Lord of the Rings Fantasy World General site with book and movie info, and more. *** Tengwar Textbook How to read and write Tengwar. *** The Council of Elrond General site with book and movie info. *** TLotR.com Movie and book info. ** Planet Tolkien General site with book and movie info and current news. ***** The Digital Middle Earth Project Very cool digital renderings of Middle-earth, including video flythroughs! JRR Tolkien Fan Art	 Good Middle-earth fan art. ***** The Burping Troll The ongoing collaborative works of a gathering of writers and dreamers. ***** The One Ring.NET The premiere movie-info site. **** Dagorhir Battle Games People beating each other up. Cool! *** Tolkien's Middle-earth Battles Setups for miniature Middle-earth warfare. *** Tolkien Games Info on all the Tolkien games out there.